An otherwise normal game in the main tournament of the 39th Myeongin has become a sensation. This is because amateur go player, Cho Insun 7D, just turned pro under the Korean Baduk Association’s new points system. On September 20, 2011, Cho Insun began his Myeongin game with Park Jeonggeun 4P in more or less the usual way. However, he knew that if he won the game he would be allowed to turn professional. And so did everyone else. Despite the pressure and anticipation of others, Cho played an excellent game, grabbing a win as well as the points he needed to take his tally to the crucial number, 100. Under the new system, amateur players can accumulate points for performing well in the professional tournaments that allow amateurs to qualify and compete. Some examples of these are the LG Cup, the Samsung Cup and, of course, the Myeongin. Cho is the first player to reach 100 points under this system and become pro. Perhaps his story will inspire other aspiring amateurs worldwide? Congratulations Cho Insun 1P. 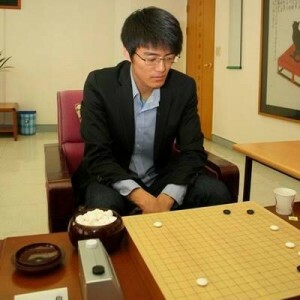 See Cho Insun’s game and join the discussion at Go Game Guru. - Jingning; based on her original article at Go Game Guru. Photo: Cho Insun 1P.